The leaves on some of our tomato plants are turning black and curling up. I've never seen anything like it. Anybody got any ideas? what type of tomato plant is it, got the genus name? Solanum lycopersicum. Which apparently covers all tomatoes This one is a big boy. Otherwise known as a slicer. it could be mold, just something to look up first before hazarding a guess. It could also be the fertilizer, since its kind of hard to tell from just one. Yep, tomatoes start out doing fine, and around the end of May they start to curl. I've had it happen twice. The first year I replanted them in commercial potting soil (I grew them in big flower pots), and then they were fine once they caught up. The second year, same thing, but I just let them go to see what would happen. They survived, but were very slow to produce, and the yield was not good. Late summer they started to perk up, but it was the end of the season, and too late. I have no idea what caused this. Others didn't know either. If you figure it out, I'd like to know. Tomato leaf symptoms are sometimes damnably hard to diagnose, but my best guess is Alternia Canker, following by Bacterial Speck. 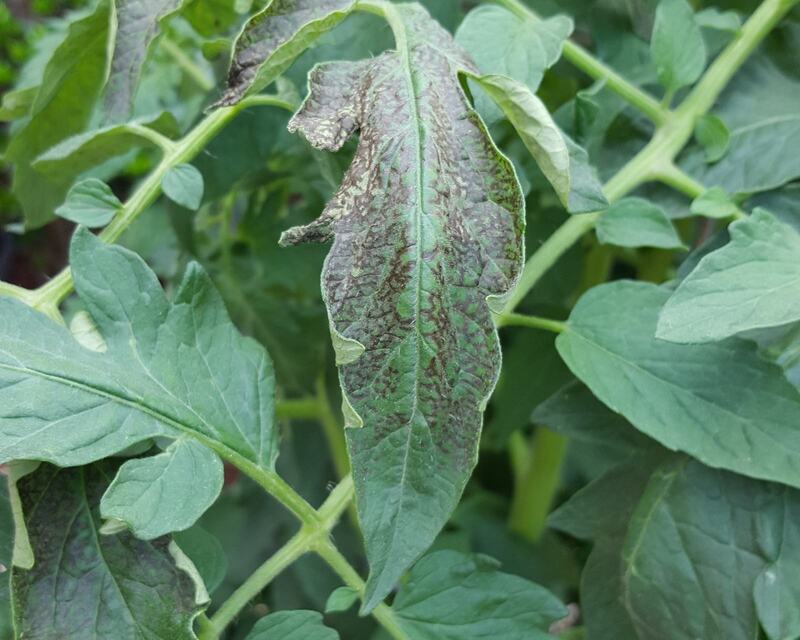 Symptoms of Alternaria canker appear on stems, leaves and fruit. Large areas of the leaf lamina between veins is killed, leading to leaf curling and eventual death of the entire leaf. Fungus overwinters in crop residue and is easily spread by wind. Wounding of young plants (by mechanical damage or pruning) provides an entry site for infection. Furrow or drip irrigation is preferred over sprinkler irrigation. Preventative fungicide sprays may be required if a “zero tolerance” for defects production system is needed. Bacterial speck is widely distributed. Symptoms may appear on any plant part. Leaves of infected plants are covered by small, dark brown, irregular patches of necrotic tissue that are surrounded by yellow halos. Disease severity is increased by leaf wetness from sprinkler irrigation, rain, or heavy dews. Minimize wetting of the leaves by using drip or furrow irrigation. Copper sprays provide effective control. For both conditions, and as a general practice, using a soaker nozzle at the base of each plant is best. Planting tomatoes where morning sun dries the leaves off quickly helps. Hybrids are more resistant to such diseases but they don't taste as good. I actually covered my heirloom tomatoes with a plastic roof one year so the only water they experienced was what I gave at the base but that was a LOT of work. What kind of tomatoes are you growing? Planting tomatoes in the same soil lets the fungal and bacterial diseases build up in the soil. And microbial-rich compost will help, but fresh soil is better. When they say hybrids are "resistant" that doesn't mean "immune". It just means they will die later. I plant my tomatoes in new spots every year. I have 6 framed beds and a spot near the house, so that gives me a 7 year rotation. The diseases are usually gone after 4-5 years. And foliar sprays in mid-day (where they soak in and dry fast) are helpful. I've been growing heirloom tomatoes for 30 years, so if there is anything else I can help with them, let me know. Impressive botany. BTW ... predictably, I have a brown thumb. We are hoping it is a You are not allowed to view links. Register or Login. We have had a lot of rain and cooler than normal temperatures lately. If not we will remove the plants. Planting somewhere else isn't an option so if it's a fungus, bacterial infection or viral we'll probably have to bleach the dirt and try again next year. Don't bleach the soil. Solarizing is better. But adding a few inches of good compost is easier. And if you have a healthy plant, take a sucker and plant it in a vase until it shows roots, then plant it out. It will grow quickly zones 7 and higher.